Mini Change Yoga is a small yoga business founded by Donna Yates Kling. Donna has been studying yoga for over 20 years and has experienced the benefits of the yoga lifestyle first hand. Her yoga practice helped her go from a multi-decade married person with two kids at home, no dog, and a job that did not serve her beliefs to a divorced mother of two with a dog named Yogi Bear (he was adopted and believe it or not that was the name he came with) and a career that inspires and nurtures her. 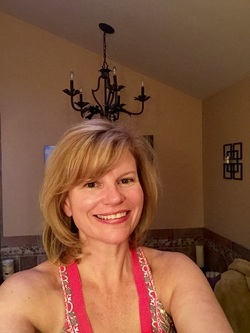 Donna has completed 250 hours of Yoga Teacher training, 1000 hours of Yoga Therapy training and completed Pilates Mat and Barre Teacher training. She also has an MBA with a concentration in finance and is a Chartered Financial Analyst who works for a Fortune 500 company.